When the Dallas Stars’ 2013-2014 season ended on Sunday night, it ended with a bang, not a whimper. The Stars held a 4-2 lead late in the third period of Game 6, needing a win to head back to Anaheim for Game 7, but couldn’t maintain their composure. They ceded three quick goals to the Ducks, the last of which came in overtime and sealed their series defeat by a score of 5-4. The Stars went up in flames in spectacular fashion. In a way, it was an oddly fitting end to a pretty wild season. All years long the Stars lived fast, and in the end they also died young…or, at least younger than they could have, considering they were a mere 24 seconds away from a Game 7 in Anaheim when Ducks forward Devante Smith-Pelly tied the game at 4-4. Was the loss crushing? Absolutely. But when you consider the fact that the Stars were a young, inexperienced team that built their entire game around speed and transition, a strategy that evokes an up-tempo pace full of end-to-end hockey and swinging momentum, it shouldn’t come as too much of a surprise. Despite the disappointing end, however, one can’t help but look at the season as a whole and see it as an overall soaring success for the hockey franchise in the heart of Texas. The slogan of the team, which was introduced early in the summer and has permeated all throughout, was fittingly “A New Star Is Rising.” Before the regular season started there was change everywhere within the organization: new jerseys and logo for the team, new general manager in Jim Nill, new head coach in Lindy Ruff, new captain with Jamie Benn, and new players with Tyler Seguin, Shawn Horcoff, and others. And, just as important, a new identity. A new lease on a franchise’s life. A fresh start for a franchise that had missed the playoffs for five straight seasons and, often times, looked lost at sea. Throwing so many new pieces into the mix and expecting them all to fit together within a stretch of 82 games? It seemed to be a daunting, maybe even foolish, expectation. Yet, 82 regular season and six playoff games later, here we are. The Stars found their identity and it led them to the Promised Land. After five agonizing years of missing the playoffs, the Stars fought and clawed and scraped their way into a postseason berth. They did it by overcoming adversity the whole way: Stephane Robidas’ broken leg, a 1-8-1 slide in January, Rich Peverley’s terrifying mid-game cardiac episode in March, to name a few. And they did so up against one of the biggest, baddest iterations of the Western Conference in NHL history. That lovably risky transition game might have ultimately cost the Stars in Game 6, but there’s no way that the team would have ever gotten to that point without it. The Stars struggled through an identity crisis for the past few years, but they finally found one this season, one that is built around the team’s greatest strength: speed. It’s that speed that led the team to big regular season upsets over the Boston Bruins, the Chicago Blackhawks and the St. Louis Blues, and also helped them give the West’s #1-seeded Ducks a hell of a challenge in the opening round. While a first round playoff exit might not seem like much of an accomplishment from an outsider’s perspective, in actuality a playoff appearance at all was a massive exceeding of expectations for a team in the Stars’ situation. Most importantly, however, was not what the Stars accomplished this season; rather, it’s the all-important foundation that they put in place that can potentially lead them to greater accomplishments in the future. There’s no denying that the Stars are a young team in the midst of a long and arduous rebuild, a team that is attempting to build something great. This was supposed to be a season of growth for the squad, and they were largely successful in doing so, growing by leaps and bounds from the start of the season right until the bitter end. All it takes is one look down the roster to see that growth embodied everywhere. There was concern before the season that the captaincy might weight heavily on the 24 year-old Benn, but he used the “C” on his sweater as a springboard, growing not just as one of the NHL’s premier two-way forwards, but also as a clear-cut leader both on and off the ice. He set new career highs for pretty much everything: games played (81), goals (34), assists (45), points (79), penalty minutes (64), and plus-minus (+21). He continued to lead the way into the postseason, with four goals. Benn truly emerged as the leader of this young team, a role that he will only continue to grow into as he ages and matures. Benn’s season-long linemate, Tyler Seguin, experienced similar growth in his first season in Dallas after being cast away by the Boston Bruins. His 84 points (37 goals and 47 assists) was a career high by a mile, and ranked him 4th in the entire NHL. Seguin emerged as a bonafide number one center, and at only 22 years of age, still has an enormous amount of hockey left to play. Defensemen Alex Goligoski and Trevor Daley, often cited as being too small to succeed in the Western Conference, eventually became a trustworthy, tough-minute-munching top pairing for the team, with both giving the best seasons of their careers. 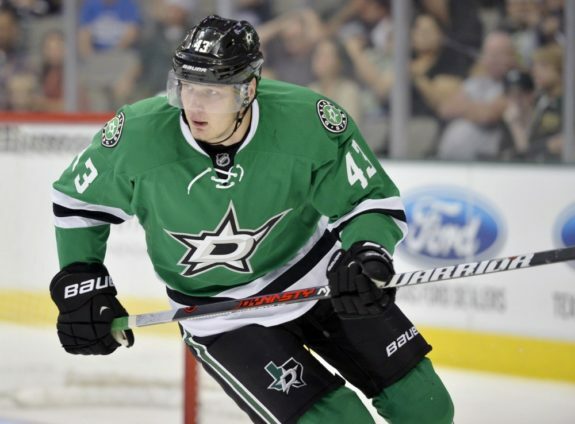 Cody Eakin, along with undrafted wingers Antoine Roussel and Ryan Garbutt, formed a surprisingly effective energy line that at times both scored big goals and shut down top opposing lines, even if they sometimes went “over the line” with their physical play and penalty taking. Valeri Nichushkin and Alex Chiasson both had productive rookie seasons. Brenden Dillon and Jordie Benn, despite a lack of experience, both looked comfortable as Top 4 defencemen, and by the end of the season rookie Patrik Nemeth wasn’t far off as well. The list goes on and on. All of that individual growth would not have been possible were it not for the two main older men overseeing the whole operation: Nill and Ruff. 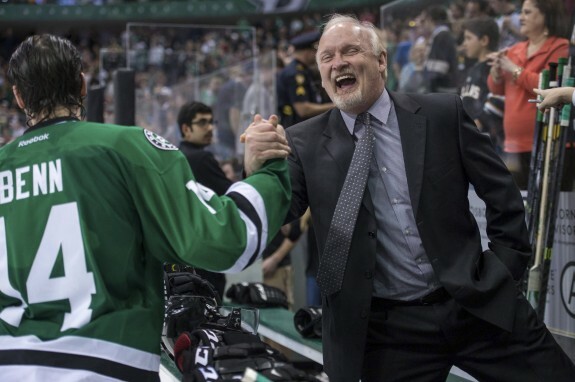 In Jim Nill, the Stars found a steadying force that not be understated. Calm, cool, and calculating, it is no longer a well-kept secret that Nill is one of the best minds in the sport, and he provides an assuring sense of confident stability that has permeated throughout the Stars’ organization. Nill’s acquisition of Seguin through trade and his drafting of Nichushkin at 10th overall in the 2013 NHL Entry Draft both look great already, and could easily go down as franchise-defining types of moves. In Ruff the Stars have a coach that seems to be a perfect fit for the growth that is occurring. Ruff possesses a wealth of experience, with plenty of knowledge and wisdom that can be passed down to young players ready to soak it up. Demanding, yet fair; intense, yet forgiving, Ruff seemed to know at all times what sort of adjustments that he needed to make for his team, and correctly implemented them more often than not. Whatever adversity struck the Stars, they usually found their way around it. It’s abundantly clear that Ruff and the players have a strong, working relationship built on mutual respect, and that bodes very well for the future. Both Nill and Ruff are new to their current roles, but put in excellent leg work in their first years. The players on the ice wont be the only ones growing with the team as the future unfolds. It’s going to be a long summer ahead for the Stars. Both the draft and free agency will be big landmarks for the club, and could have a major impact on the finer details of what the roster looks like come training camp in September. In spite of this, the Stars can enter the warmer months with their heads held high after what was accomplished this season. With an impressive young core wanting more, and a couple of knowledgeable veteran minds to show them the way, a new star has risen in Dallas, and it is shining very brightly.